Yeah I need to finish my reviews for the other recent Star Wars movies, but I watched this yesterday and wanted to get this out while the movie was still fresh in my mind. This will be a pretty short review, but I hope it’s pretty clear that its length doesn’t correlate my affection for this movie compared to other reviews I’ve written. In short, I loved this movie. I FINALLY got a Star Wars movie that isn’t about the fate of the whole frickin’ universe, and there’s no Jedis, no force, none of that! It’s almost shocking how small-scale Solo: A Star Wars Story is. There’s a few key locations on a few different planets, but there’s no excessive location-hopping and scene cutting back and forth. 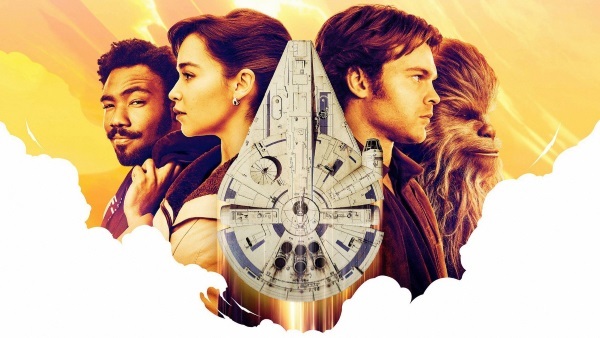 The movie pretty much focuses on the key character, Han Solo, and only adds a dash of scenes for villains, side-kicks, etc. I think the casting was perfect; Alden Ehrenreich was great as a young Solo, channeling a bit of Harrison Ford but not trying to do an outright caricature. Donald Glover nearly steals the show as Lando, bringing style and swagger. Emilia Clarke and Woody Harrelson also shine in their roles, making the viewer constantly wonder just whose side they are on. Paul Bettany is great as the movie’s key villain, never ever going over the top and is more of a quiet threat that perfectly suits his style of acting. While this movie evidently had a rocky road on the way to the theater, I think both director Ron Howard and writers Jonathan and Lawrence Kasdan (how awesome to write a Stars Wars movie with your dad?!) have given us a very strong independent Star Wars movie, and for me it’s not only for sure in my top 3 picks, but it might just be my favorite Star Wars movie!